It’s a well known fact that farmers often put off going to see their GP, perhaps because of their remote location, busy routine or awkward surgery hours. However, the impact of poor health for a farmer can be huge, and more often than not there simply isn’t the option to take sick leave as there is no one else around to get the farm work done. 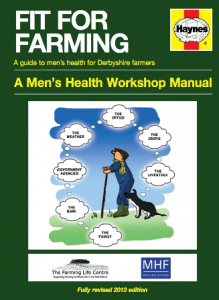 In 2013 The Farming Life Centre produced an updated edition of ‘Fit For Farming’ for Derbyshire farmers. We had picked up a copy of the first edition of the booklet at Bakewell Market a couple of years previously and had always felt that it would be great to have a bespoke version for Derbyshire farmers. Thanks to the support of Derbyshire County Primary Care Trust, FLC’s Health Trainer, Carol Lloyd and Manager, Julia Cook were able to work alongside Kate Dale from Yorkshire Agricultural Society to rewrite, expand and update some of the content of the first edition – focusing in particular on the topics of aging well and mental health. Our new edition was launched at Bakewell Market in June 2013. Two years later, Farming Community Network took up the gauntlet and commissioned a revised 2015 edition. Like its predecessor, this new Fit for Farming is a glossy A5 Haynes Manual for the most important piece of kit on the farm – the farmer! It’s full of useful information and tips on wellbeing and health, not just for the man of the house, but for the whole family. It has been put together with the support of a number of farming charities, rural support networks, the Men’s Health Forum and the HSE – a fantastic pool of knowledge to draw on for up to date and relevant information. Copies of of Fit for Farming are available from The Farming Life Centre.